Texting My Pancreas: Anatomy of a Dexcom Graph. 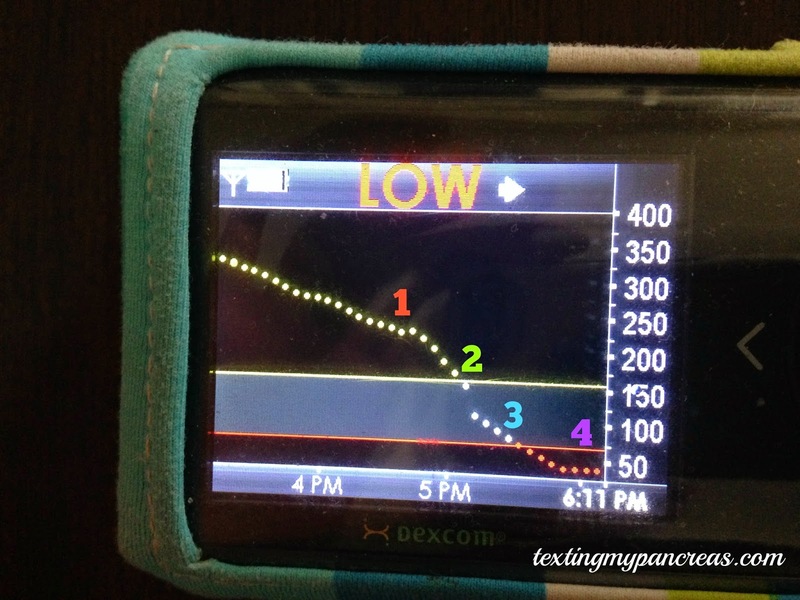 Anatomy of a Dexcom Graph. At first glance this graph looks... not fun, but something along the lines of "you were running high, did a correction bolus, and then you were low". 1. "Why is this high so sticky? I under-bolused for that sandwich at lunch because I could see I was dropping and knew I'd be home alone with my daughter for the next few hours, but apparently I overdid it. UGH. This feels so gross, and it's almost dinner time. Since all of those corrections over the past few hours didn't do much, I'm finding out what my pump would suggest for a correction bolus if I had no IOB and bolusing that amount." 2. "Yaaaaasss. Now stick the landing, you glucosey blood you." 3. "No no no noooooo [insert curse words here] do not want, stop it. Just level off! Stop dropping! You're good! Just stay right here!" I find myself doing this thing where I underbolus for food or just run a little higher in general when I'm with my kid because I don't want to drop low while I'm the only one responsible for her, but I usually end up rage-bolusing my way out of it and end up low anyway, the very outcome I was trying to avoid in the first place. Wow, so doge meme, how obsess, much annoy husband, very giggle! YES THE DOGE MEME!!!!!!!!! Much giggle. 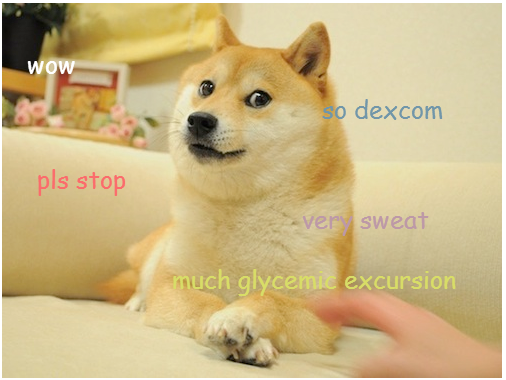 So Dexcom! "No no no noooooo [insert curse words here] do not want, stop it. Just level off! Stop dropping! You're good! Just stay right here! ::: Wait a minute... what happened in that blank space between #2 and #3? How could that happen? [insert coping mechanisms to turn off over-analyzing everything here]. What was that reading again?" Revisit: What We Aim For. The t:slim Air Bubble Dilemma.